It’s always the same story: mom doesn’t feel good, we make a doctor’s appointment, the doctor asks, “How do you feel?” mom answers “fine, thank you,” he updates her prescriptions, we go home and all we’ve accomplished is my wasting another day off work! I’m totally sick of it. What about my job? Your boss probably knows that by 2010, as many as 54% of the workforce will be caring for an elderly parent or relative. Mom may be in denial, may be afraid of a serious diagnosis, or may want privacy when she talks to the doctor. To help decrease your stress and increase productivity: 1.) Keep an ongoing list of mom’s complaints, including the date and time of day she felt ill. Bring it with you or send it to the doctor before your appointment (be sure to keep a copy). 2.) If mom is an early riser, decrease waiting time by scheduling the first or second appointment in the morning (late riser, schedule right after lunch). 3.) Talk to mom. If your presence in the exam room bothers her, promise to keep a low profile. 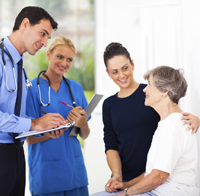 In private, explain the situation and give the nurse a copy of mom’s list of complaints. Request the doctor read it prior to the exam.